In short … we are travelers, bloggers and photography is our passion. We dedicate our life to explore the world and live adventures while we share all our experiences in our blog. We both met in Mykonos, but in this story there were no mojitos or night clubs. On this Greek island we were street vendors and we were looking for tourists to sell them our handicrafts in order to make cash so our travel dreams could become a reality. We started working on our first big travel project, going around the world on a motorcycle. 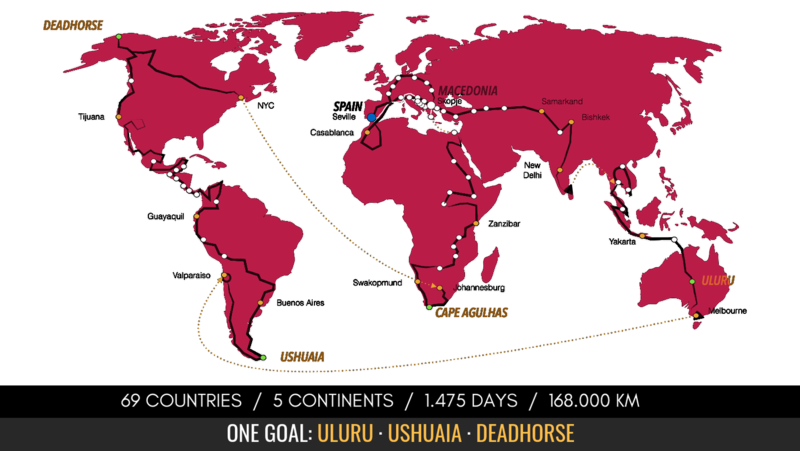 Since April 2013 and for more than 4 years we managed to cross all continents from one point to another. 69 different countries that we visit uninterruptedly crossing places like the deserts of Atacama or Namibia, the Amazon rainforest, Patagonia, we arrive to the Arctic seashore and we cross the Pamir mountains in winter. Among other achievements, this project made us the couple that spent most time traveling on a single motorcycle. Now we have converted a classic 4×4 van into our home and workshop. On it we will keep traveling the world in search of new stories to share. Our life philosophy and the challenges we have overcome made AROUND GAIA a reference among travel and adventure lovers. We live on the route giving talks in the different countries we visit, like that we try to motivate our audience to fight for their own dreams, to trust in themselves and to believe that getting a better world is possible. As a personal mission we like to spread a message in defense of the environment and for this we turn our van into a small cinema where we project the images we record of some of the NGOs that we visit and which are working to protect our planet. IF YOU ARE ENJOYING OUR WEBSITE AND YOU WANT TO HELP US TO KEEP MOVING AND SHARE NEW STORIES, YOU CAN DO IT NOW WITH A DONATION, PAY US A COFFEE OR A LUNCH. ALL YOUR SUPPORT, IT DOESN´T MATTER WHETHER IT IS A LITTLE OR A LOT, IT´S IMPORTANT FOR THIS BLOG. to. Use that energy to inspire yourself to create more unique articles.